The design makes perfect conceptual sense for a large vehicle that needs to get into and around tight spots in a hurry. But inherent complexity makes them prohibitively expensive which is why (until this year) you only saw a "two-headed fire truck" in one place: the Mont Blanc tunnel between France and Italy. That tunnel is where, on March 24th 1999, 39 people died in a quickly-escalating conflagration for which rescuers were hopelessly underprepared. Reports say it all started with a Volvo refrigerator truck hauling flour and margarine. Driver Gilbert Degrave is said to have spotted smoke in his mirrors, stopped his rig in the middle of the tunnel, and been met with a facefull of fire as soon as he peered under the cab to investigate. The two-lane Mont Blanc tunnel is a little more than 21' wide. It didn't take much time for smoke to make seeing or breathing near impossible. Traffic was too tight for reversing, full-size big rigs made a mess of the road trying hopelessly to turn around, and only a few cars were able to exit before the tunnel turned into a pitch-black cylinder of death. Alarms were sounded and two fire trucks were dispatched from the French side of the tunnel, downwind of the blaze. But trying to drive a full-sized fire apparatus down a road littered with abandoned vehicles and clogged with soupy air proved impossible; the trucks would not have been able to proceed even if their engines hadn't choked on the horrifically noxious blend of chemicals they were trying to breathe. Firefighters were forced to abandoned their rigs and take refuge in "fire cubicles;" little cells along the side of the tunnel specifically designed for such an incident. A handful of drivers also made it into the cubicles. Others got lost wading through the toxic air seeking escape, the rest rolled up their windows and waited for rescue. But the tunnel's ventilation system was shuffling deadly gasses around "faster than anyone could run," and investigation later showed that Italian authorities fueled the fire by forcing additional fresh air in from their side. Regardless, most attempts at escape were in vain. The cubicle doors that fire crews and escapees were hiding behind were supposedly rated to survive "two to four hours" of direct fire. The 1999 Mont Blanc tunnel fire raged at 1,830 °F for 53 hours. Reports say it took another five days to cool the tunnel enough to start salvage and repair operations. 50 people were trapped in the fire altogether, of which 11 (remarkably) survived with serious exposure injuries. For a more complete analysis and breakdown of the disaster, see structural fire and engineering expert Professor Colin Bailey's research paper. The tragedy would beget years of investigation, blame-placing, and compensating of victims. Even Volvo was brought under scrutiny for potential defects in their FH12 cargo trucks. The Auto Routes Mont Blanc (ATMB), a joint taskforce of Italian and French authorities whose sole charge was to improve safety in the Mont Blanc tunnel, had a lot to answer for and a lot of work ahead of them to win back public confidence. The ATMB ordered an improved ventilation system, better cameras, more robust disaster shelters, an entire control center dedicated to monitoring the tunnel, and one badass rescue vehicle that's basically a fire-fighting ninja on four wheels: The MAN BAI Janus 4000 "Bifronte." 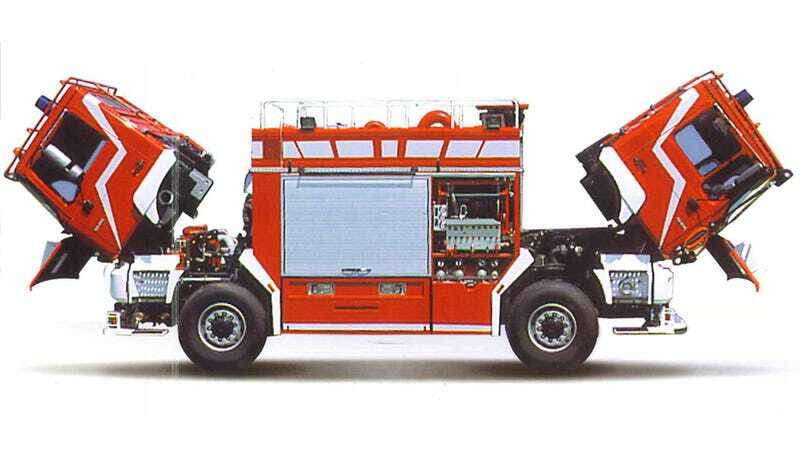 Built by Italian fire apparatus outfit BAI, the Janus is based on an MAN 19.414 chassis-cab truck. Or rather, two of them. It can be driven from one side by one person like a normal truck, or all four wheels can be employed to steer controlled by one or two people. Command of the vehicle can be quickly switched from one side to the other so the truck can switch directions abruptly, or crab-walk through traffic and around obstacles. But it can do much more than skirt around anything, anywhere. Placed at numerous garages throughout the Mont Blanc and staffed 24/7, the three Janus trucks are fitted with infrared cameras that feed information to screens in the cabin, helping drivers see through smoke. It carries 4,000 liters of water and 500 of foam, which can be blasted from turrets on either front end by rescuers sitting snugly in the cab using joysticks. A pressurized cabin and air intake system keeps the rig running (and its passengers breathing) through smokey air, though the Janus can gallop at 120 MPH in either direction under good conditions. Janus trucks are still in use at Mont Blanc today. As for Nanjing's interest in this type of vehicle, I wonder if the country's notoriously poor air quality has their rescue teams considering extra protection like what the original Janus provided... or if their version was put together purely for maneuverability.